Studio Ghibli co-founder Isao Takahata passed away this morning at the age of 82. Takahata has been fighting some health problems over the past few years, with it worsening last summer. He died of heart problems peacefully in his home in Tokyo, surrounded by loved ones. When it comes to anime companies, there are certainly none as admirably well known as Studio Ghibli. Studio Ghibli has been responsible for a number of the best animated films on the market since it was founded over 30 years ago. Their most notable creations have been Spirited Away, Ponyo, and My Neighbor Totoro. For most of his career, Takahata worked with Studio Ghibli co-founder Hayao Miyazaki. The two were close friends and together they revolutionized and popularized the entire anime industry. It is safe to argue that, if it were not for Takahata and Miyazaki, anime would not be as prominent in the world as it is today. During his career, Takahata directed 28 anime movies and even earned himself an Oscar nomination for his work on The Tale of Princess Kaguya in 2013. 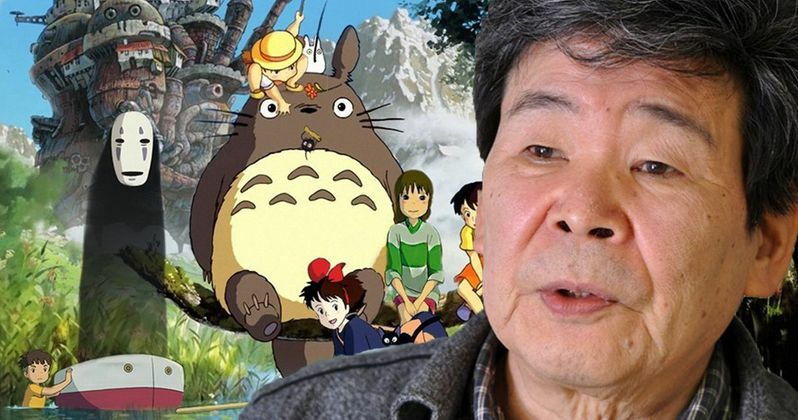 His most notable achievement, however, was his work on Grave of the Fireflies, one of the first feature length films for Studio Ghibli that he solely directed. It was a lovable, heartwarming movie that put the company on a truly fantastic track. Not only did Takahata work closely with Hayao Miyazaki, but Takahata's work before joining Studio Ghibli was what inspired Miyazaki. Takahata was the greatest influence on Miyazaki, from whom Miyazaki based most of his work, and eventually they became close friends. All in all, there's no limit to describing the wonders Isao Takahata did for the world. Had it not been for Takahata's work, Miyazaki may never have had the idea to start Studio Ghibli. And had Takahata not worked with Miyazaki in Studio Ghibli, the company may not have received as big of a start-up as it did, and it's arguable that they would've gotten nowhere. When it comes down to it, if not for Isao Takahata, anime would likely not be nearly as popular as it is today. Those who worked with Takahata would describe him as "hard working" and "meticulous." He would never risk his work turning to poor quality, even when in a rush. While Miyazaki was more focused on deadlines and schedules, Takahata never strayed away from one goal: creating as beautiful of a product as possible. Said Kazuyoshi Tanaka, a Studio Ghibli exhibition producer, describing the animator in 2014. "Takahata has a freer lifestyle. If we didn't call him up, he could disappear until sunset. We need to send staff members to pick him up ... he forgets about time and place when he is in deep thought... Takahata is meticulous in his work, and never compromises quality in the face of deadlines. Even Miyazaki is scared of him." While Takahata may be gone, his legacy lives on in the anime work today. While there are many anime movies and shows that aren't made under Studio Ghibli, most of them tend to be at least partially inspired by the work of Takahata and Miyazaki. The anime industry owes Takahata a great deal of gratitude for the work he did in his life. According to Yahoo Japan, there is currently no word at the moment as to the details of Isao Takhata's funeral. While many of his followers may hope for it to be a large event, it is very possible that his family and friends will want to keep it a private event to honor the filmmaker.